At this time of year I begin to feel a little weighed down by all the heavy foods of winter. Do you? I start to crave something light and healthy to finish the meal. Something simple and sweet, while still being warm and wintry. Pears are the perfect choice. They're in season now and so beautiful. And they pair perfectly with cloves which, to me, is one of the quintessential flavours of winter. Now, while I know that there are healthier ways to eat a pear, I just love them poached and still warm, and topped with something creamy after a heavy January dinner. You could top these with ice cream, or a little lightly whipped vanilla cream, or even some sweetened mascarpone, but I really like to pair it with Greek yogurt. The tang of the yogurt cuts the sweet syrup perfectly, and provides just the right contrast. I prefer a full-fat honey or vanilla Greek yogurt (like this), but if low fat fits your style, use that. Just make sure it's a bit sweet. 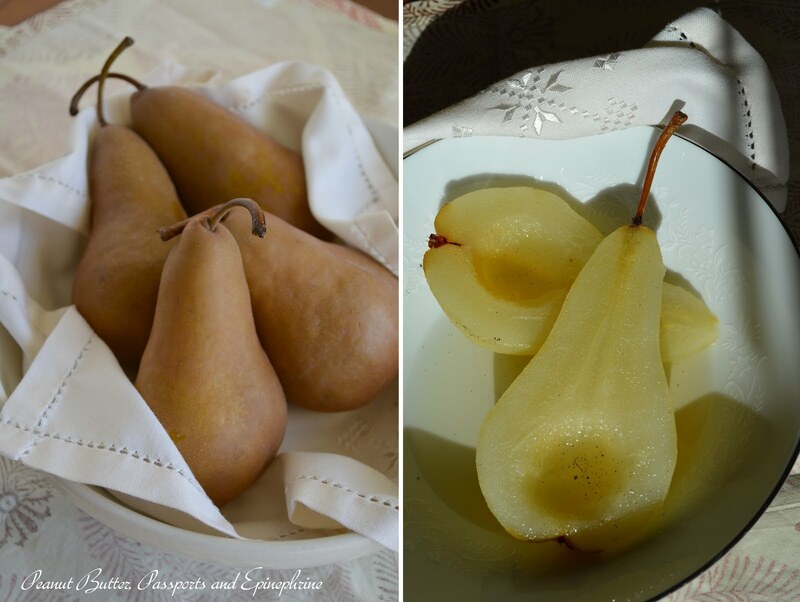 As for the pears, choose ones that are still a little firm and crunchy. They'll hold their shape and look gorgeous on the plate. Beurré Bosc are my favourite but d'Anjou would work well, too. Make sure the pears stay completely submerged throughout the entire cooking process. 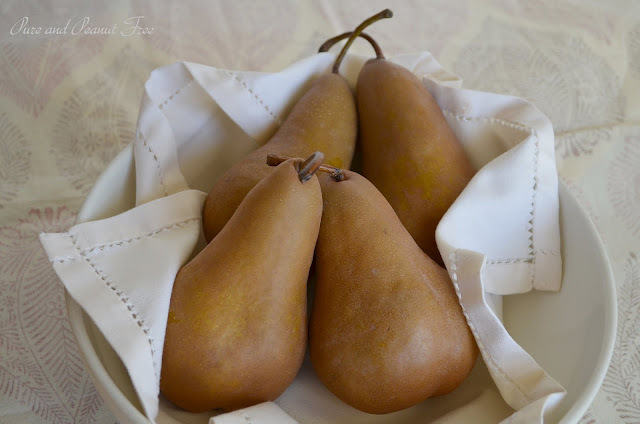 To do this, I cover the pears with a plate that is slightly smaller in diameter than the pot. The perfect, easy and elegant winter treat. It really is a showstopper, isn't it? Peel the pears and cut in half lengthwise leaving the stem intact. With a spoon or melon baller, scoop out just the centre core. Stir the wine and sugar together in a medium sauce pan. Add the pears to the pan and pour in enough water to just cover the pears. Slice the vanilla bean in half lengthwise and scrape out the seeds. Add the seeds and the scraped bean to the pot. Add the cloves and salt. Bring the pot to a simmer. Cover the pears with a small plate (to keep them submerged) and turn the heat to med-low. Simmer the pears for 15 -20 minutes, until very soft and a knife pierces the flesh easily. Remove the pears from the pot. Discard the cloves and the vanilla bean. Raise the heat to med-high and boil the syrup until reduced by at least half (15 - 20 minutes). To serve, place one or two pear halves in a bowl. 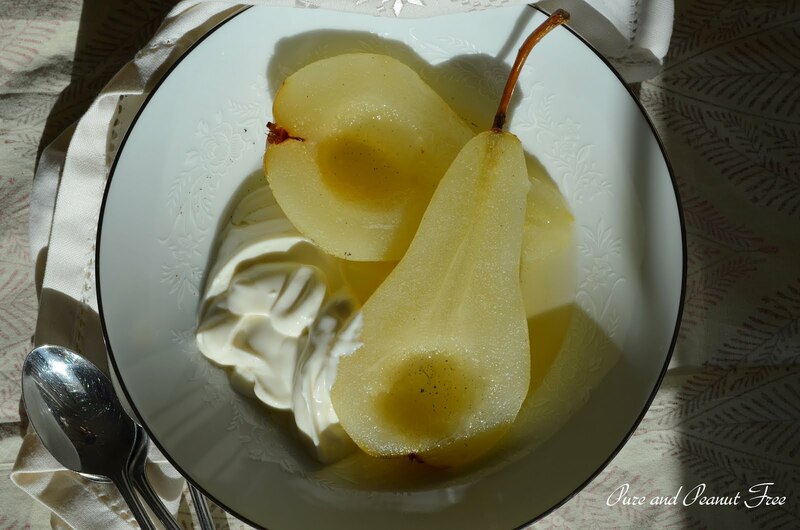 Pour the hot syrup over the pears and serve with a dollop of yogurt (or whipped cream) on top. Serves 4 - 6. For other great, gluten free recipes, check out gluten free fridays! suit your needs? I wouldn't mind writing a post or elaborating on a few of the subjects you write about here. Again, awesome blog!